Tricks & Treats Halloween Hop - Apple-y Ever After! 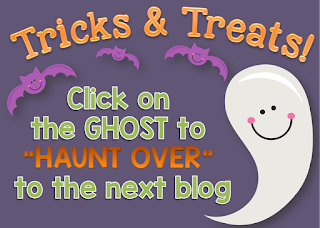 Velcomme to zee Triks and Treats Halloveen Blog Hop & Geevaway!! Did you read that like Dracula? 10 points if you did! 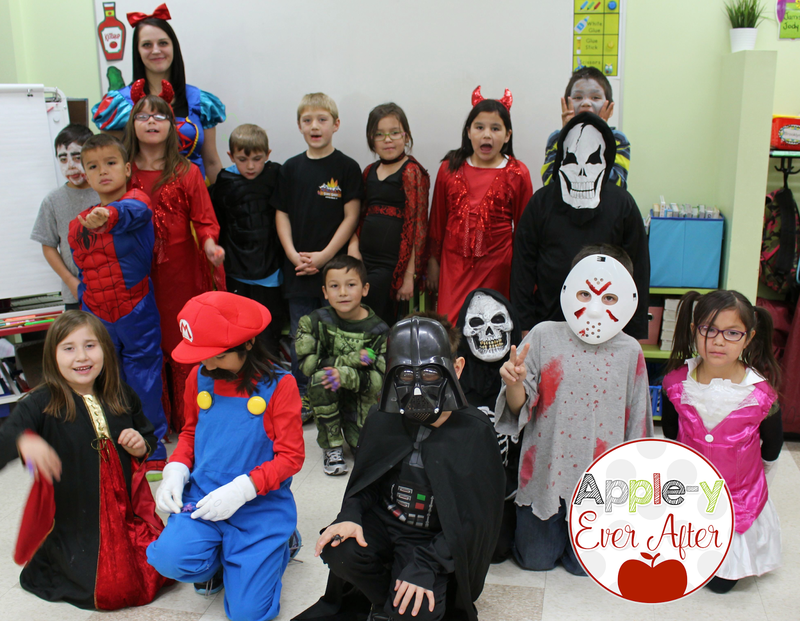 I'm so excited that you are here, and I can't wait to share with you some of the exciting things we do in my class to make Halloween a spook-tacular celebration! 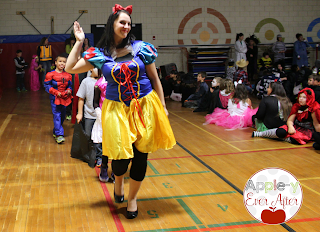 In my school, we participate in many fun Halloween events! In my classroom, the festivities last all month long! In my classroom, the festivities are even more amplified! I LOVE HALLOWEEN and since I don't have any families who do not celebrate, I have a license to spook (don't worry, I'm not that scary). Here I am with my cuties during Halloween last year! In my classroom, I am all about games for students to learn with. I teach a very diverse class and as such am always looking for new ways to teach them new skills. One of the things we have been working on is number patterns and skip counting. For my class, tallies are still a skill that we are trying to foster into our day. We tally boys and girls who are present in class, we tally objects around the room. These things are easy, but the part that my students struggle with is counting by 5s when adding them up! Frankenstein to the rescue! 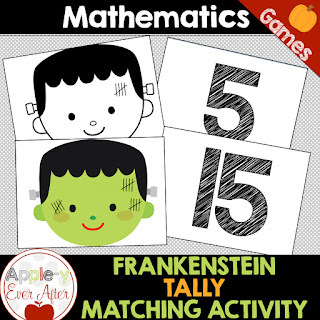 I created this fun frankenstein matching game for my kiddos with the idea in mind that I really wanted to get them familiar with this concept. I wanted them to be independent in counting tallies by skip counting by 5's and I want them to have fun while doing it so that they remember it easier. Here is what this fun activity looks like! Notice the scar tallies on these bad boys? My kiddos LOVE this. They count the scars and get to match the number of tallies. I like to use these cards with my students in a number of ways. 1.) I use this during introductory guided math lessons with my students so that I can see that they are doing it correctly. 2.) I use them during whole class instruction so that we can learn together. 3.) I have a 'roam the room' activity where each student has one card, and the other one is hiding around the room. My students have a scavenger hunt to find the card that matches the tally or number that they have. 4.) Partner Match - Students get one card each, and they need to find their partner with the matching number/tally on it. Don't forget to enter my secret word ~Pumpkin~ into the rafflecopter below for chances to win wonderful prizes!! post to continue on our spooktacular event! If you like this package, you may also want to check out my frankenstein craftivity pack! What a cute freebie idea!! Love it!! I love the Frankensteins with the tallies! What a creative idea! This is HYSTERICAL! Can I just tell you I was drawing scars on a Frankenstein face at school just this morning? Just pinned to Canadian TpTers board - let me know if you'd like to join! Awesome! I would love to join :D Thank you for thinking of me! 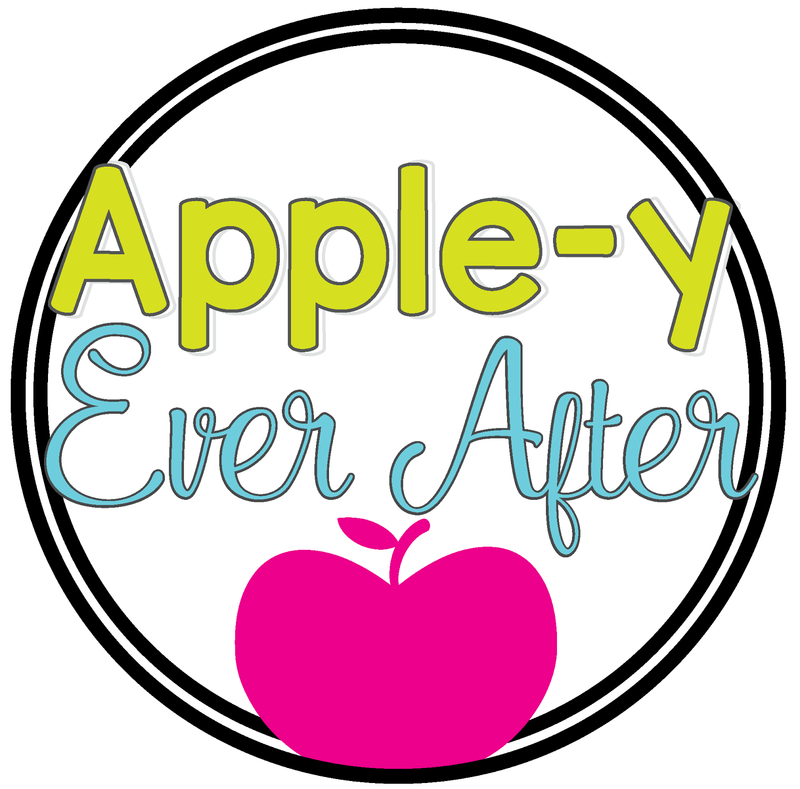 The link to my pinterest account is above! Hopefully that's all you need to add me!